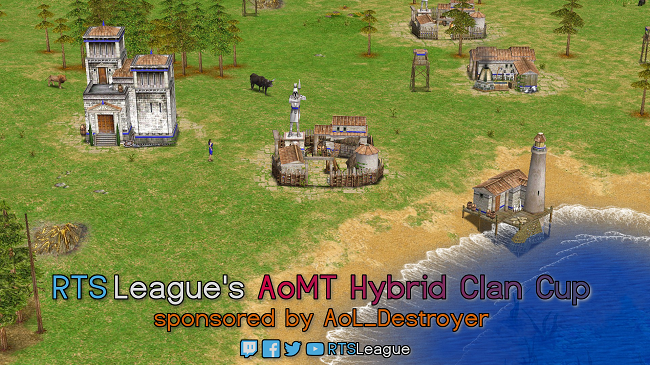 RTS League's AoMT Hybrid Clan Cup Begins! 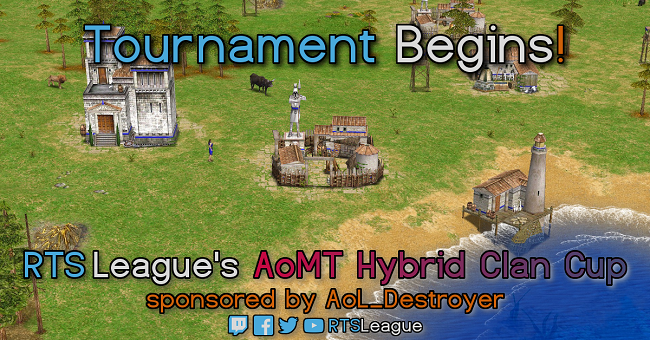 The epic moment we've all been waiting for is here - the first Age of Mythology: The Titans tournament hosted by RTS League that is not the Clan League begins! AoMT Hybrid Clan Cup is filled with participants and ready to see who is the best at accommodating to new challenges and fully prepared to fight for the sweet prize pool from the community benefactors totalling quite nice 180€! Quite a lot of motivation to put in all the best from the start, and we'll of course showcase the efforts to you live on our channel twitch.tv/RTSLeague and later on YouTube - all the while providing coverage on our Facebook and Twitter. Follow us all there, but much more importantly, follow the tournament and the clans fighting in it, and choose your favourite to cheer for! Who is it going to be? Gl&hf to all the clans, and may the skill be with you! Clan Operators of participating clans should read the whole posting with detailed information on our web. Hi all. As a host of this SM i want to post it here for some more coverage. Some of this from Keen_Flame party map pack (thanks for this maps, they are very good), some from older patches (Nile Delta), some are modded by me (with CMT_), and some are just interesting maps that are not in the std mappool. -Spoiler- If the overall reception of this SM would be positive i`ll try to host a tournament on this maps for in autumn. New Step for RTSL - AoMT Hybrid Clan Cup Opens! Recorded games will be uploaded and available in the RTS League Replays forum here at RTS-Sanctuary. DoD_Shelty and DoD_Joe will clash for the Title signifying the current best duelist - we're looking at a Best of 7, so plenty of games for us to enjoy and see them battle for the prestige (and prize ) in. Match will be streamed live with commentary at twitch.tv/BlackAddersPlays, so come see who is going to prove himself better and get ready to cheer your favourite onward! Player, Joe, Fox, Brickhead, Grandmonster. Matreiuss and Mor tied, but Matreiuss is the de facto winner by alphabetical order (sorry Mor). Player, Joe, Fox and Brickhead earned a bye in the first round of the bracket stage for getting the most points. Matreiuss receives a bye as well because I am removing both ikill and jelly for failure to schedule a tiebreaker and inactivity. Nobody has time to wait for them. Therefore, there is a (somewhat wacky looking) bracket. 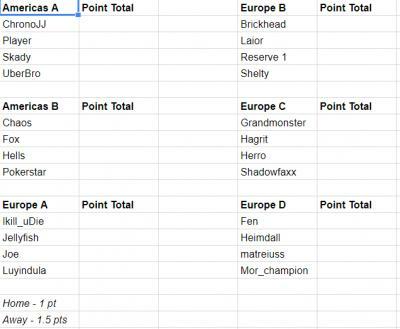 Players were first seeded by group stage points, so the first four above mentioned received a bye. I seeded Player 1, Joe 2, Fox 3, and Brickhead 4. Then, I gave a bye to Mat over Grandmonster because he played all his games and had more points. From there, Mor plays Skady, Shelty plays Hagrit and I play Grandmonster. Please review the rules, and remember to play your games by next Wednesday preferably. Just use either tournament schedule forum to do so. Also, please remember to have these matches streamed. The 2018 RTS-Sanctuary Winter Tournament has begun! As a quick review, the tournament will be broken up into two stages, a group stage that will run from today, 12/12 to 1/1 and a bracket stage in January. Since there were 24 sign-ups instead of 32, that leaves one less bracket round, therefore we are giving the group stage one additional week. Players were seperated into European and American (South and North) groups for some extra competition (and easier scheduling). As a quick note, Mor and Uberbro were the only 'worldwide' entries, sorry fellas. We are still holding out for 1 sign-up to be placed in Europe B, if anyone still wants to sign-up. Players in that group can just start scheduling as normal now. The two players with the most points in each group advance. Players receive 1 point for a 'home' win and 1.5 points for an 'away' win. So basically, 2 away wins are equal to 3 home wins. Each match, Player A (decided alphabetically) picks their god and their homemap. Then, Player B selects their god. It is reversed for the second game. Game 1 would be considered a 'home' game for Player A. Matches are 2 games. Don't forget to tune into the showmatch on December 16 at 17 GMT as well. We have Boit casting at least 3 showmatches on www.twitch.tv/rtssanctuary. The prize pool will be finalized by the 17th after the show matches. Stay tuned and good luck! Again, players have until January 1 to complete their 3 group stage matches. 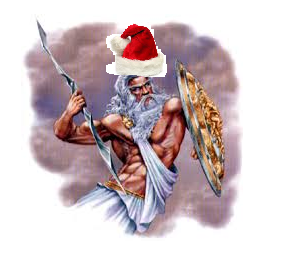 If you see Zeus with the Santa hat, you know its that time of year! Over the last few holiday seasons, it has been tradition here at RTS-Sanctuary to host a tournament. Over the years, it has been the premiere battleground for players to gain bragging rights in 1v1 play. Last year, in a match that had over 400 viewers, Magic won an epic best of 11 series vs Themista to take home first place. This year, we are going to spice things up a bit with a new format, and some show matches that the community can tune into for the benefit of the community, the tournament, and its players. Get your keyboards and mice ready, review the 3.0 patch notes, and watch some Magyar recs. It's time to show that smurfing paid off. The tournament will be 8 groups of 4 and will likely be organized by region (NA, SA, EU, etc.). The remaining 16 players will play in a 1v1 bracket. This means the eventual champion must win 7 matches to take home first place. Group play will run from 12/12 to 12/26. Bracket play will run as soon as players can schedule rather than by weeks so that games can be played quickly. Just like last year, we hope to have a Grand Finals around January 20th. This effectively means players must schedule a total of 6 matches in 6 weeks. In Group play, matches are two games. In game 1, Player A selects a home map and their god, then Player B selects their god. In game 2, it is the opposite. Player A and B is decided alphabetically (IE Magic vs Mor, Magic is A). There is 1 veto per player within 1 minute. 1 point is given for a win, 0 for a loss. 1/2 point is given to a player for each match they play. Bracket play is Best of 3 games until the Grand Finals which is Best of 7. Each game is random map. There are no god rules, and each player gets 1 veto, except for the finals (2 vetoes). There will be a Sunday Showcase live streamed on December 16th. We will ask for donations for the tournament. Donations will go half to the players, and half to the prize pool for the tournament. I will take the community's suggestions for who they want to play, and I will organize it. Signups end on the 11th. Groups will be posted on the 12th. Please PM me with any ideas or suggestions.